In a previous post, I told the story of how I came to write a new score for the 1910 version of Frankenstein, done by Thomas Edison's company. 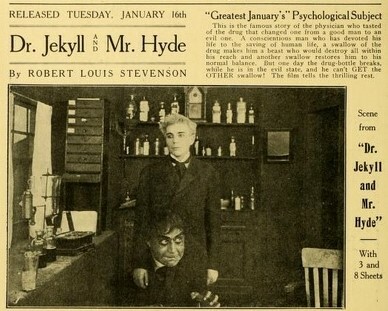 Needing to come up with at least three ten to fifteen minute films to score for an upcoming screening, I eventually found my number two: The Strange Case of Dr. Jekyll and Mr. Hyde, from 1912, directed by Louis J. Henderson of The Tanhauser Company. The plot of the film is, of course, simple, based on Stevenson's novella and also upon a play version written by Thomas Russel Sullivan in 1887. In this short film, Dr. Jekyll, seeking a pharmacological way to separate evil from good within the human animal (ostensibly as a start to purging evil from mankind) designs a concoction that he is willing to test upon himself. But, as Sting so succinctly puts it in his song "If I Ever Lose My Faith," it's hard to find miracles of science that don't go "from a blessing to a curse," and, after repeated use of the drug, the evil Hyde begins to have his way with Dr. Jekyll and pop out whenever he wants. My approach to scoring the film was, again, traditional, with thematic motifs for Jekyll and Hyde as well as a theme for Jekyll's love, who is simply billed as "Jekyll's sweetheart," played by the ironically named Florence La Badie. The love theme was a result of some research. I found that the biggest hit song in America at the time of the film was "Let Me Call You Sweetheart," and, although I could have simply used it, since it is public domain, I decided to create a thinly-veiled variation on its main melody. I writing the Frankenstein score, I had realized that the approach had to be carefully done. I had no desire to write tongue-in-cheek scores that, in any way would mock the films, nor did I want to do what I had seen countless other silent film re-scorers do: go all...bizarre and noisy and synth-ey. I wanted to to capture the films' innocence and a mix of the tone of the early silent film music approach and that of the post Bernard Hermann era. The "horror" of these films must have seemed more intense to audiences of the day, but, the films -- and live accompaniment scores of the day -- had a certain melodrama to them which meant completely dark and humorless score would not have captured the spirit. Somehow, I remembered -- probably imperfectly -- Carl Stalling's brilliant introduction music to the Bugs Bunny short, "Hair Raising Hare," which I always had loved, and I fashioned the opening chords with their echo in my mind. The rest took shape from there. By this time, I had upgraded my sound samples a little bit [I had mentioned in the post about Frankenstein that my samples on that one were "stock" with my new program and not top quality] and I had gotten some orchestral "effects" -- some quirky and spooky articulations of the strings and winds, which I put to use not the J&K score; you can hear plenty in Jekyll's first transformation. I also did some simple -- even predictable -- but effective things, like using a downward-running sweep of the wind chimes for Jekyll turning into Hyde and an upward-running version for his turning back into Jekyll.